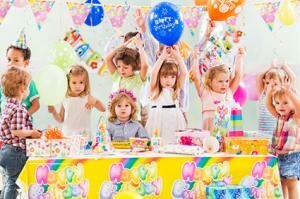 Coming up with birthday party ideas for one year olds does not have to be a daunting task. Because most one year olds are not old enough to put in a large party request, you can use whatever ideas for the birthday party work best for the whole family. When it comes to planning your child's first birthday party, you should keep in mind not only your child's personality but also your own preferences. After all, this special birthday is one that you want to be memorable for yourself, your baby, and the guests. If you want a cutesy baby theme, then you can turn to themes that are available from online and retail party supply stores, such as character themes that are currently popular. Some themes, like those based on toys and licensed characters, are inherently easier to pull off because of the abundance of supplies available. The more unique and/or unusual your party theme, the more effort you will need to put into the party preparation. If you're looking for a more modern and adult theme, consider themes that you would throw for an adult party, but put a childlike twist on it. For example, you might choose a Hollywood theme for the first birthday party, but instead of having babies walk on the red carpet to enter the party, stroll them in using a "blinged" out stroller. Who you invite to the party is totally up to you. If money is a factor, keeping the party small and intimate and to family and close friends can be ideal. If you want to have other children your child's age in attendance, then inviting some or all the children from their daycare class is the way to go. Some parents opt to bring in cupcakes and favor bags to celebrate with the children at daycare and then have a private party for family and friends outside of daycare. If you invite a lot of young kids or have a large amount of cousins attending the one year old's birthday, consider renting a party place for the big birthday bash. A separate room with a door can keep crawling or walking one year olds corralled, and allow you to enjoy the party without worrying about cleaning, food preparation, or activities. Infant and toddler gyms, music classes, and even libraries may have rental areas suitable for a one year old's birthday. While having the party at a banquet hall, restaurant, or kids' party place takes some of the pressure off you, you still have involvement in choosing the menu, linens, and other party details. The main difference is that on the day of the party, they take care of the set up. You're still going to have to manage the guest list, send invitations, manage RSVPs, and continue communication with other vendors involved in the party. 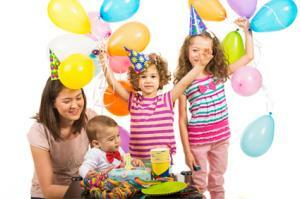 It can be time consuming to plan and implement any party--be it for a one year old or for another occasion. If you plan to tackle the planning on your own, start as early as possible and take care of the details a little at a time. Enlist the help of family members and friends so you can delegate some duties. A party planning checklist can come in handy in organizing and carrying out the planning, regardless of your plans. As many parents of toddlers, preschoolers, and older kids can attest, one year olds rarely understand what the hype is about on their big day. Instead, they are happy to play with the gift wrap and eat cake. Therefore, it is useful to have some fun ideas for the other guests to partake in to make the day special for everyone involved. Set up a large buffet table with jumbo cupcakes in whatever flavors your child (or you) prefer. Have several choices of frosting available, along with edible decorations, like sprinkles, colored sugars, chocolate candies, jellybeans, nuts and coconut flakes. Have each child, with parent help and supervision, make their own creation. You can showcase each of the creations and hand out prizes to each child for their effort. While the one year old may not be able to make a wish on his or her big day, others can do the wishing in his/her place. Record guests' favorite memories of the child from the first year of life along with a special message for him/her in the future. Alternatively, you can set out a scrapbook where everyone can write a message for the birthday boy/girl. Save this in a special place and show it to your child on his/her 16th birthday, 21st birthday or another milestone birthday. Instead of playing the usual birthday party games, let everyone outfit the birthday boy or girl in a brand new t-shirt. 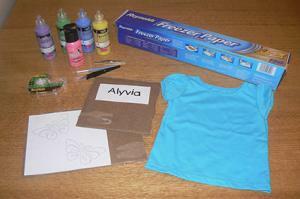 Purchase a bunch of plain white undershirts, and put out fabric markers, sequins, and other decorations. Snap a photo of the birthday boy or girl wearing his/her newly made shirt with the guest who made it. Use it for the cover of thank you notes. In the birthday party invitation, ask each guest to bring something that signifies the day of the child's first birthday. This item can be something that represents the child's current personality or something going on in the current year. Put it all in a box and add to it each year on the child's birthday, so she/he has a box of keepsakes from childhood. Write a letter to your child. Tell him or her all the milestones s/he has reached over the last year. Tell him/her how you feel. Describe your child's personality and characteristics. Slide the letter into an envelope and mark "1" on the front. You can continue your annual letters until the child turns 18 and then give the package of letters as a gift on the 18th or 21st birthday. While one year olds might not get excited about creating keepsakes, you should plan some fun entertainment ideas to keep them busy. Put down a play mat or section off an area for free play. Kids at this age aren't going to adhere to a structured schedule, so they'll need some down time. Place toys in the area that are age appropriate. You can even place chairs around the play area so parents can sit and supervise the play. You can also opt to rent play items, such as a ball pit that isn't too deep, so that one-year-olds can play in it. Foam pits are another great option so it's easier for the children to move around in it. Ask someone who is animated and a good reader to read a story to the children. Assemble the children in the play area (after cleanup) so they can listen to the story and see the pictures. Choose storyboard books and stories that are easy for the children to follow along. In other words, choose age-appropriate books. 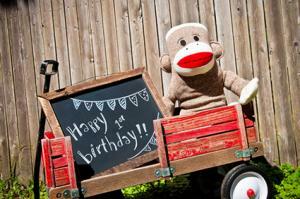 Decorate your child's wagon with party streamers and decorations. You can even add a banner or sign that has your child's name on it. Give the birthday boy or girl the first ride. Take the rest of the children on rides throughout the party. Set up a path through the indoor party area or go outside if the weather is nice. Bring out a CD with children's songs on it or start a round of songs. The ABCs, Old McDonald Had a Farm, Twinkle Twinkle Little Star, and The Itsy Bitsy Spider are all good options for this age group. You can even provide instruments for the kids to use during the sing-along, such as tambourines and small plastic maracas. You can serve foods that cater to children and then serve a separate set of foods that are better suited for the adults. One year olds tend to use their hands and fingers to eat, so serve plenty of finger foods that are kid-friendly. Check that none of the guests have allergies before you plan the menu. Small peanut butter and jelly sandwiches, grilled cheese sandwiches cut into small bites, and fruits are some of the items you can put on your menu. Graham crackers and Cheerios are another great option for this age group. Even yogurt cups with baby spoons or the squeezable yogurt packets for babies are great food options for the younger partygoers. Cupcakes or cake are a must as well. The first birthday cake or cupcakes can be in the shape of or have symbols on top that represent the theme of the party. Don't forget to serve with a scoop of ice cream or frozen yogurt on the side. Make child-size utensils available for the kids that are learning to use and already using forks and spoons. Adults can also eat sandwiches, fruits, cakes, and cupcakes. 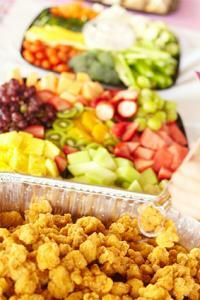 You can opt to serve a meal in addition to the finger foods. Pasta dishes and pizza can be filling options that are also budget-friendly and perfect if there are teens in attendance. For outdoor events, you may opt for barbecue foods, such as hamburgers, hot dogs, grilled chicken, and sides such as potato salad, baked beans, and salad. If you are hosting a fancier sit-down meal, you can choose to serve chicken dishes, fish, or beef dishes with sides like green salads and sweet potatoes au gratin. Whatever birthday party ideas for a one year old you come up with, do not forget the basics. Pick up 1st birthday party invitations and 1st birthday party decorations and party favors to round out your festivities. These items can really bring the theme and the activities together.